Though not commonly a significant source, foragers aggressively forage for both pollen and nectar on Hibiscus. I hope all is going well with your retirement. Good to see you last night but little time to visit. Thanks for leaving a msg. It the first I have gotten (actually the only one) so I needed it for practice. Thanks for looking at the pages. Everything is under construction. Nice shots of the hibiscus foragers — I have a red flowering hibiscus that the girls work (casually, though — almost in passing toward better sources). Delighted to hear that you’re coming back to Auburn …. I’ve thought for years that we need someone like you in our state. BTW: thanks for posting your presentation notes on your website; I downloaded them for reference materials. I’m a first year beekeeper and have attended both the state convention at Montgomery and symposium in Auburn. I really enjoy listening to your presentations and learning from your vast experiences in bee keeping. I feel we here in Alabama are blessed to have you share your knowledge and your time with us. I’m looking forward to Feb. 4th, 2012 in Auburn. Hope you are enjoying your retirement and that all is well with you, your wife and family. 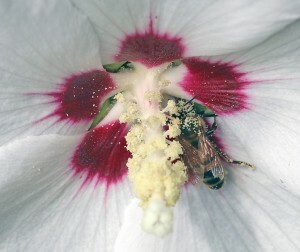 Great pics of the bees and the hibiscus. Enjoying the Backyard Bee Keeping on your website. Wow – Larry – Thanks. You are the kind of AL beekeeper for whom I am trying to build an electronic site. So far, all that I have posted is to help me learn how to formulate, submit product and coordinate various social media programs. Thanks for your kind comments. I hope we can both continue to grow in beekeeping. I’ve enjoyed your new site and writings! Every now and then I check on you online, and was delighted to see your new adventures. Your photos are amazing! My best to you in all your endeavors. I didn’t realize you were out there. On facebook I have tried to separate family/friends on my home and set up a page (Jim Tew) for beekeeping issues (primarily as an Auburn presence), but alas all remains mixed. Please stay in touch.